Seattle Pops is owned and operated by a Seattle family: The Janes family! The idea of Seattle Pops began when Megan & Suzie made an impromptu move to Birmingham, Alabama for graduate school. One day, our friend Meredith said: "We are going to Steel City Pops! They sell popsicles!" we had never heard of a shop selling all pops. When we arrived, we instantly fell in love and knew Seattle would too! Megan began planning how to bring this back to Seattle. We spent countless hours in the kitchen with Dave [the dad! ], on the computer, working with local business students from the University of Puget Sound, and visiting all neighborhoods of the city... two years later, after a lot of hard work and planning, Seattle Pops was born! Our first test to the Seattle Market was a freezer stand manned by Megan, Suzie and Dave with neon Popsicle signs at the Phinneywood Block Party in 2013. After receiving amazing responses, we decided to go full force, applying to local farmers markets for our first season in 2014, and we haven't looked back since! we strive to ensure every customer leaves with a smile on their face. to achieve this, we believe in: strong customer service, providing a quality product, and a happy environment. if you are ever dissatisfied with your seattle pops EXPERIENCE, please contact us! The Janes Family! Dave. Megan. Lindsey. Suzie. We strive to ensure every customer leaves with a smile on their face! We accomplish this by: executing EXCELLENT customer service, providing a high QUALITY product, and creating a happy environment for CUSTOMERS and team members. 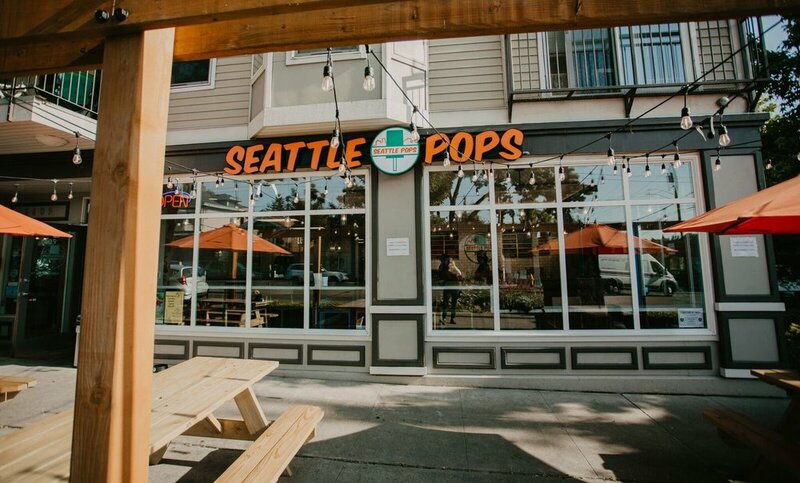 Seattle Pops are inspired by the traditional Mexican Paleta, which come in two varieties: Fruit Based & Milk Based. After much research and recipe testing, we have created our own paletas, which we refer to as Seattle Pops! Our pops are minimal in ingredients and bursting with flavor! We achieve this by using seasonal, fresh, and local ingredients. Our Pops never have artificial flavors or coloring. We use real Organic-cane sugar in our pops, (we never use high fructose corn syrup). Seattle Pops Truly are ALL-NATURAL and as fresh as we can get them! Our Fruity Pops are 100% Vegan. Our Creamy Pops are Milk Based. All of our Pops are Gluten-Free. If you have any questions about our ingredients please email us! If you are interested in learning more about our availability and receiving a quote, please fill out the information below and a team member will respond shortly with a quote. Please allow 24-48 hours for a response. What is the date of your event or when you'd like your order? Thank you! We will contact you soon! Your order is not complete until you get confirmation from us. Please email us at: catering@seattlepops.com and a team member will get back to you shortly. Seattle Pops is proud to partner with local charities and events to help gather resources and funds for those in need. Trick -or- Can 2018, Megan and FamilyWorks Rep. Trick -or- Can is a fundraiser put on by Seattle Pops with help from local Competitive Softball Teams. 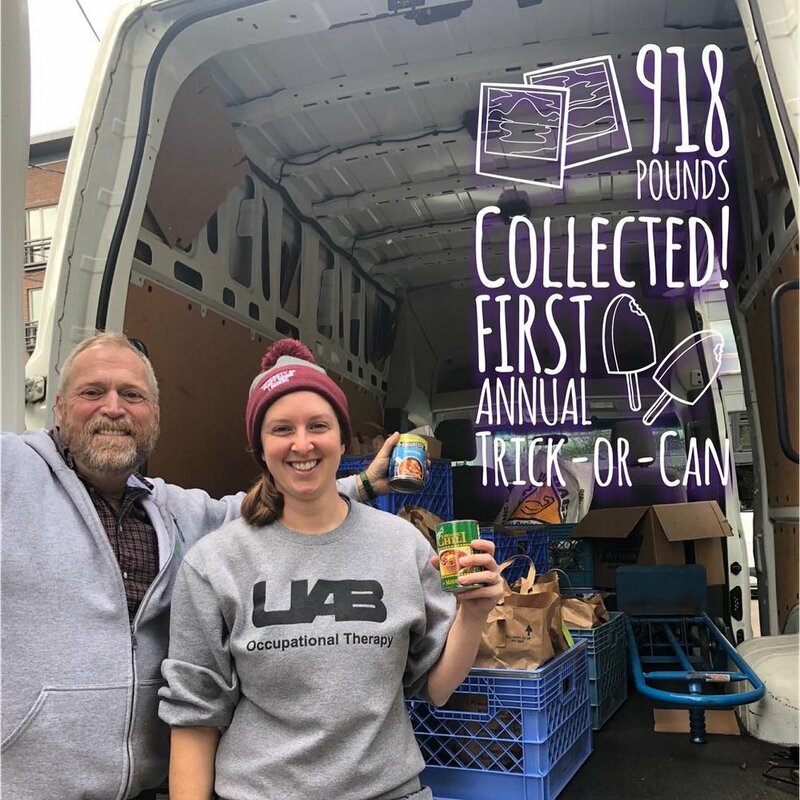 Each October, we partner with FamilyWorks Family Resource Center to collect as many non-perishables for their food bank. In 2018 we were happy to start the Scholar Popper program. The scholarships are funded through a percentage of our tips collected from our catering services. Our first year we were able to provide scholarships to three of our team members to help with their schooling costs! We look forward to continuing and building this program! Christmas Trees on our Patio 2017, Suzie. 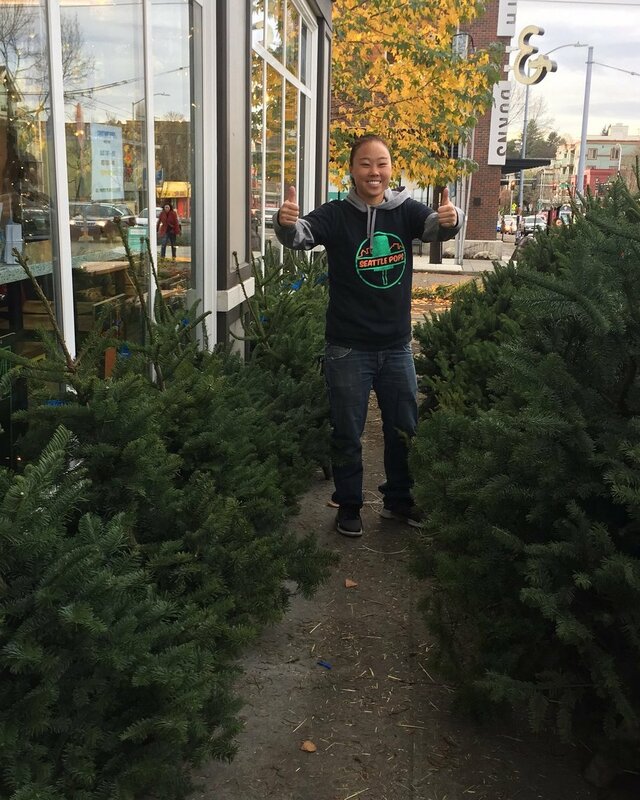 Each December, we sell fresh cut, local Christmas Trees on our Patio at our Wallingford Shop. 100% of the profits go to “Adopt-a-Family” ~ We are assigned local families who are in need of necessities such as food, jackets, bedding, etc. 100% of the profits are used to provide for several families each year! Let us know if you want to partner with us! 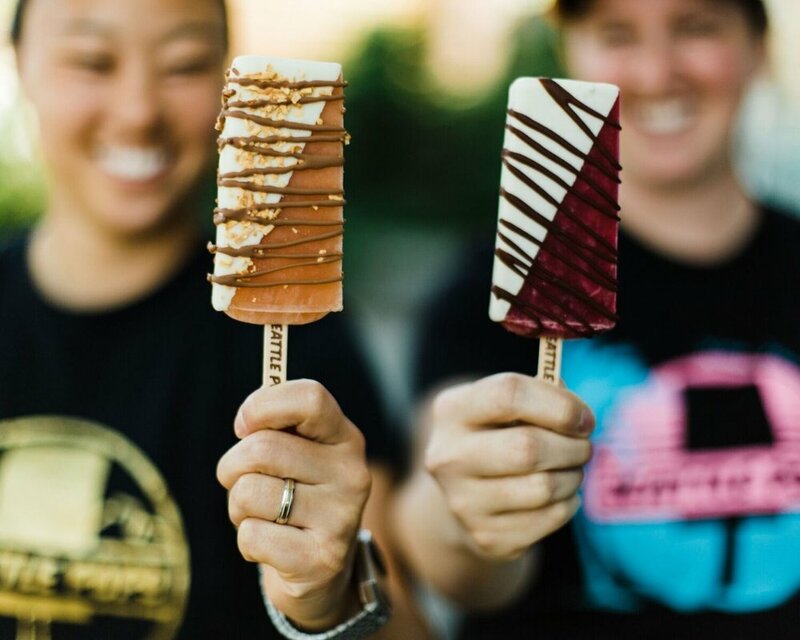 Seattle Pops helps raise money for local schools by selling pops at their events and donating 20% of the revenue straight back to the school. We also donate gift cards to fundraisers. If you are interested in partnering with Seattle Pops for your school, contact us! If you have an upcoming event at your school, we would love to attend! We bring our set up, sell our pops to your attendees and your organization keeps 20% of the sales! We have done events in the past such as: School Carnivals, Back to School Nights, Graduations, and more! If you are interested, please fill out the form below and we will get back to you on our availability!